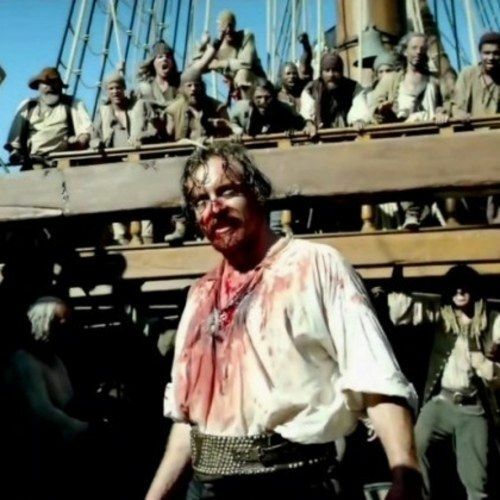 War is coming to the high seas in the first trailer for the upcoming Starz series Black Sails, debuting in 2014. Michael Bay serves as executive producer in the 8-episode series, which is set 20 years before Robert Louis Stevenson's classic novel Treasure Island. Toby Stephens stars as Captain Flint, with Luke Arnold portraying the latest addition to Flint's crew, John Silver. They square off against rival Captain Vane (Zach McGowan) for control of New Providence Island. Check out the latest footage from this pirate series. The 8-episode first season of the pirate adventure centers on the tales of Captain Flint and his men, and takes place twenty years prior to Robert Louis Stevenson's classic Treasure Island. Flint, the most brilliant and most feared pirate captain of his day, takes on a fast-talking young addition to his crew who goes by the name John Silver. Threatened with extinction on all sides, they fight for the survival of New Providence Island, the most notorious criminal haven of its day - a debauched paradise teeming with pirates, prostitutes, thieves and fortune seekers, a place defined by both its enlightened ideals and its stunning brutality.